Gourmands are in for a Taste of Dubai at Nobu Kuala Lumpur! For one week in July, Nobu Corporate Chef and Chef de Cuisine of Nobu Dubai, Chef Hervé Courtot is bringing Nobu Dubai’s signature dishes to Nobu Kuala Lumpur. 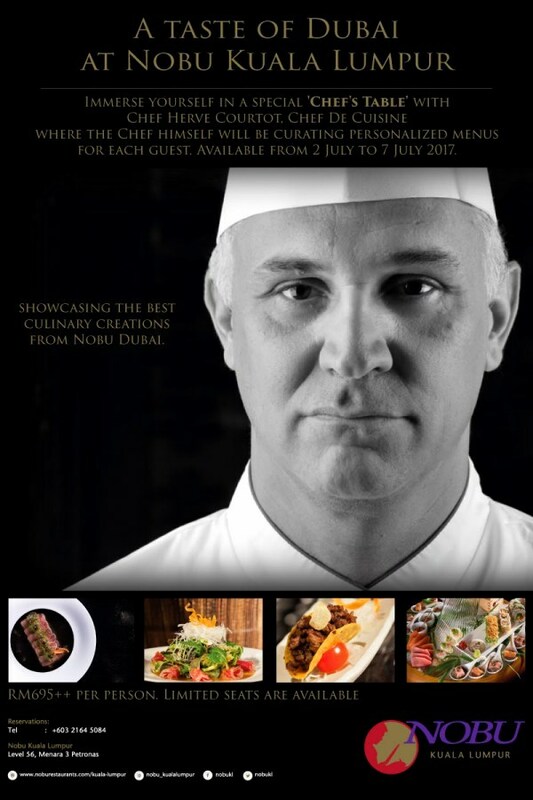 Available from 2 July to 7 July, the award winning chef is going all out with a selection of sumptuous dishes from Nobu Dubai’s menu. Besides serving the menu from appetizers to mains and desserts, diners will also be in for a treat with Nobu Dubai’s cocktails as well as liquid desserts. 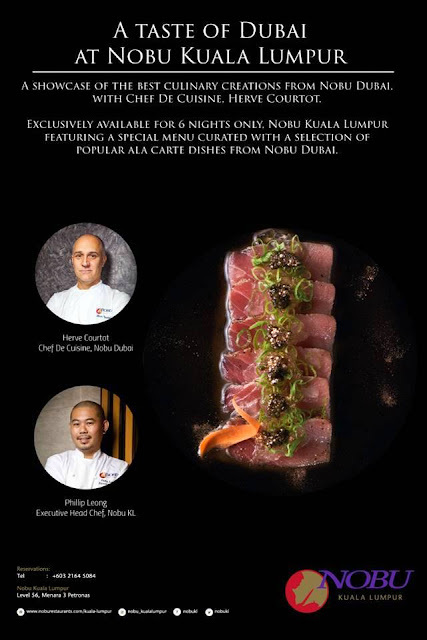 For the first time in Nobu Kuala Lumpur, Chef Hervé is holding a distinct Chef’s Table dining experience where diners will meet with Chef Hervé together with Chef Philip Leong, the Executive Chef of Nobu KL, to curate their own 8-course dinner. It is certainly a unique dining experience to be able to savor this special Chef’s Table in our very own city. Chef Hervé Courtot brings a wealth of global culinary experience from his past stints in some of the finest fine dining restaurants and five star hotels around the world. He started out as Chef de Cuisine at Nobu Dubai under globally–renowned Chef Nobuyuki Matsuhisa in 2008 and has continue to excel his way up to his current Nobu Corporate Chef today, responsible for the operations of Nobu franchises at Riyadh, Monte Carlo, Moscow, Cape Town, Doha, Marbella and Ibiza. Together with Chef Philip, it’s a culinary indulgence of exquisite Nobu signatures in the heart of our metropolitan city. Before the gastronomic journey began, we couldn’t resist a taste of Nobu Dubai’s famed cocktails. The Japanese Gimlet, a potent and delicious concoction of Tanqueray Well, lychee puree, yuzu and kaffir lime syrup, certainly jazzed up my senses with anticipation of what’s to come… Kampai! Edamame has always been a favorite of many and the version here is elevated with lux truffles in Truffled Edamame. Sweet plump edamame beans tainted with heady aroma of truffles, what’s not to like? The next dish of Scallops with Yuba featured crispy golden yuba puffs, turned inside out, stuffed with scallop before fried to much crispness. Finished with crisp greens and a moreish sauce, it was a light and delicious starter that echoed a dish of local influences from our very own shore. Presentation is equally as important as taste in Nobu and the next dish of Konbu Tacos with Beef Dry Miso & Ikura certainly looked contrastingly beautiful. Mini crispy dark kelp taco shells are filled with tartar of beef flavoured with dry miso and finished with briny salmon roes as well as edible herbs and flowers. It’s an explosion of salty umami notes with this mini taco! Little bright yellow discs of Foie Gras Pumpkin Chips with Mustard Miso looked adorable on the long white plate. However, it didn’t prepare us for the wow factor of flavours that followed when we popped this into our mouths. Foie gras melted with much lusciousness, followed by crispy sweet pumpkin chips and a hint of creamy zingy mustard notes, can be summed up as some sort of brilliant culinary sorcery of flavours. More lavishness followed pursuit in this beautiful Swarovski crusted tin, filled to the brim with Caviar & Wasabi Mashed Potato. Chef Hervé’s collaboration with the famed crystal Swarovski took opulence and elevated it to sublime heights. Generous servings of briny black caviar was a match made in heaven with the zingy wasabi infused mashed potatoes. Since caviar is very sensitive to certain materials, we were also given fine pearl spoons to indulge in this food of the Gods. My personal favorite dish of the course was this haunting beautiful platter of Salmon Tataki with Black Sesame Dressing & Jalapeno Jelly. The contrast of the luscious and aromatic black sesame dressing with lightly seared salmon, completed with a hit of heat from jalapeno jelly and black caviar, can be summed up with one word, divine! The dressing was so amazingly addictive that we even asked for spoons to ensure we do justice for the sauce. My foodie-in-crime next to me whispered “If only all salads were like the Spinach Dry Miso!” Sheer simplicity with a compilation of crisp baby spinach leaves, well tossed with a citrus dressing and sprinkled with crispy yuba. One cannot visit Nobu without trying its signature Salmon Nu-Style Sushi. When Chef Nobu first created his nu-style sashimi, the dish won over many chefs and foodies all over the world, including me. Nu-style features sashimi just lightly cooked from a hot sear of aromatic oils and Nobu’s special soy sauce. This one is ravishingly yummy with much unctuousness of umami notes. The Yellowtail Jalapeno Sushi is already marinated in a special sauce, hence no further soy sauce or condiments are needed to enjoy this. The toasty sesame seeds and jalapeno added much oomph to the creamy yellowtail sushi. Only the braves would pair chocolate with fish and the sheer boldness of Chef Hervé’s dish of Chilean Sea Bass with Yuzu White Chocolate Sauce paid off. The steamed cod was gorgeous, cleverly enhanced with a creamy white chocolate sauce, pumpkin puree and crowned with roasted seaweed. While the white chocolate sauce was a tad too sweet for my liking, the overall flavours did work well together as the pumpkin puree and yuzu balanced up the flavours to compliment the creamy sweet cod. Another personal favorite of mine was this masterpiece of Wagyu Hobayaki with Anticucho Den Miso. Served in a bronzy magnolia leaf, grilled wagyu smothered in Nobu’s famed spicy Peruvian anticucho sauce was exceptionally pleasing in flavours. The added pumpkin puree and hijiki gave the dish much finesse and flavour. So marvelous in flavours and texture that one cannot help but to keep reaching out for another piece of this delectable wagyu! Not only did the savory menu impressed us but so did dessert! A cleverly deconstructed Yuzu Lemon Tart with Shiso Jelly looked gravity defying at sight. Zesty yuzu custard sandwiched with almond shortbread and served with crispy meringue and shiso jelly, proved that some classics can be made better with out-of-the-box creativity. Zinzli Banana Passion not only looked pretty but tasted heavenly. The components used chocolate from Venezuela and is skillfully turned into panna cotta cream and mousse served with passion fruit banana puree, almond crumble and fruit gel. When savored together, magical flavours satiate the palate, igniting a very satisfied sweet tooth monster in me. Another chocolate divinity took form in Guanaja Pineapple Tartar with Coconut Lime Szechuan. Chef Hervé used Peruvian Guanaja chocolate in his chocolate sponge covered in chocolate crust with coconut crowned with chocolate mousse and served with a lightly heat tainted tangy pineapple tartar. Its dark, its rich and it’s a dessert for chocolate lovers! Now if you may be too lazy to enjoy desserts, there’s also the drinkable desserts on the menu. Two on this list and boldly potent too. Blatantly strong in flavours, both Tiramisu Martini and Espresso Martini will jolt your senses into fine frenzy, in a good and delicious way. Made from Kahlua, Frangelico, coconut cream and more, the Tiramisu Martini is velvety luscious and delicious to the very last drop. The Espresso Martini, a composition of Absolut Vanilla Vodka, Patron XO, expresso and more, is quite a caffeine banger and is perfect for coffee lovers that requires a solid jolt to end their meal. The Chef’s Table is priced at RM695++ per person from 2 July to 7 July 2017 and comes with 8 courses, completely customized per table at Nobu Kuala Lumpur. For inquiries or to make reservations, please call 03.2164.5084 or Whatsapp 019.389.5085.